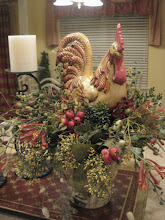 Kristen's Creations: The Christmas Decorating Has Begun...Come And See!! The Christmas Decorating Has Begun...Come And See!! Hey guys! I've been busy! I know it's not even Thanksgiving yet, but I have to start early in order to get all my houses done. This is a client's home I worked on yesterday and today. She is the one that loves the mesh ribbon. And Yes...this tree took a while to decorate... almost 4 hours! I helped this sweet lady last year after she just moved into this beautiful home. Some of you might remember me posting some pics. 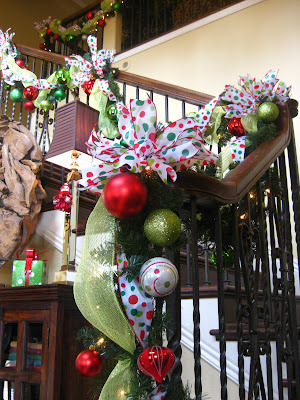 This year we decided to add more ornaments and ribbon to the tree and stairs to make them even more fabulous! This tree is a 12 footer! I love the way it turned out. The whimsical lime green and red are really popular this year. Click to enlarge. Wow! It's gigantic! She just found the cute tree skirt and it looks perfect! She bought alot of the ornaments at Sam's and pier 1 Imports. See the circle garland? She bought it at the Cracker Barrell, it's really fun and contemporary! I think she is going to have a family portrait done for the niche, that will be beautiful! More ribbon and ornaments made the garland apear thicker and really add the "umph" it needed. The piece in the middle of the cabinet is a wooden sculpture. The ribbon and oranments are all from Sam's. They have some wonderful things! 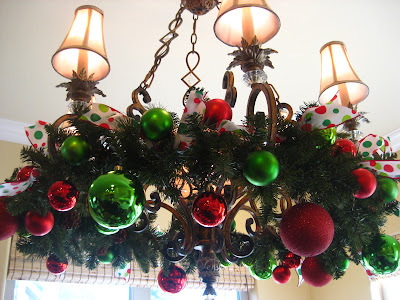 I dressed the chandelier up with garland, oraments and ribbon. 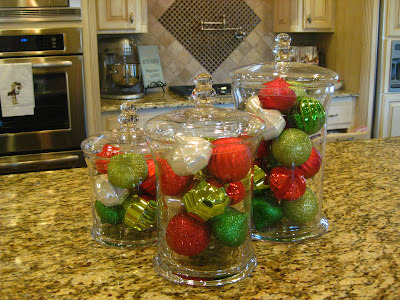 The jars with ornaments were perfect in the middle of her island. Visit the Bradford Exchange to find some beautiful and unique Christmas items for your home including ornaments, snow globes, music boxes and more. They also carry Disney and Thomas Kinkade. Kristen...I am always so amazed by your talent!!! You have such an incredible ability to put these things together and create gorgeous works of art...that's what they are really!!! 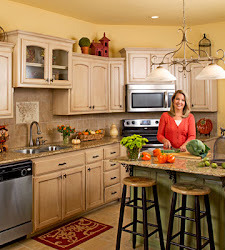 I remember this home from last year and I love all of the new things you have added to the mix...truly stunning!!! Can't wait to see the rest of your client's homes...and yours!!! I have followed your friend, Melissa, for some time and today decided to check your blog and etsy shop because I fell in love with Melissa's intial frame you made for her. Do you take requests? If so, I would love a couple of frames. I am stunned by your floral creations. What talent you have and my eyes just can't get enough. Thank you for sharing what you do and providing inspiration for all of us. gorgeous... you have a dream job. I would love to do that stuff. ITS FLAWLESS, AND BEAUTIFUL! Just beautiful! Really puts me in the mood for Christmas. So, you're coming to Long Island when? : ) What a fabulous tree, Kristen, and what a fabulous job you did! Is the ribbon in pieces and tucked in or did you go around the tree like you would a garland? The staircase looks great, too. 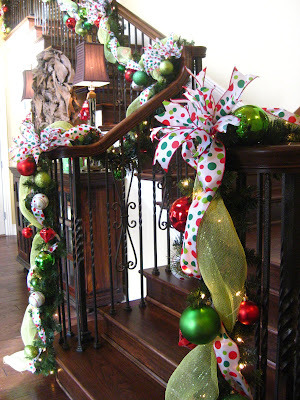 I had always had a problem getting my faux garland to look good on my staircase, but last year was better. I'm hoping this year I can hit it dead on to what you've done. Can't wait to see more! Oh Kristen...what a great job you've done....but Xmas already YIKES !!!! This does look like a fun tree with all of those pokadots! Kristen...this is lovely. The colors are very bright and cheery! 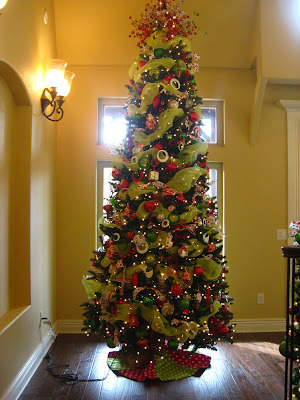 Wow, what a eye catching tree, I see in the stores that the lime green color is very popular. It is so bright attractive. You do just an amazing job. Oh how fun! 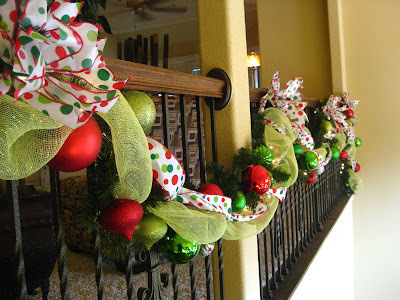 I'm so excited for all the holiday decorating posts about to go around blogland. Everything looks beautiful! How stunning is this! 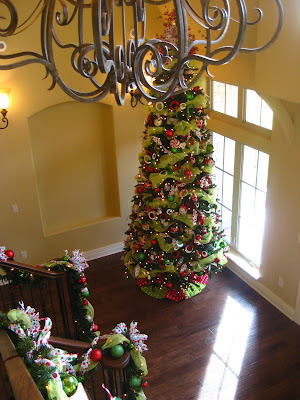 Her tree is magnificent and that staircase is a wow for sure! You know just the right thing to do to give it that magic touch everywhere. Very pretty Kristen! You've inspired me to really think about what's happening here. Just WONDERFUL! I love the bright green. I am doing a white tree in my libray(office) with bright green and a touch for hot pink. I will be sharing it later. Kristen, I love the tree, I am going to do green and gold, I am not really into red for Christmas as strange as it sounds. That is soooo beautiful ! It's getting me in the Christmas decorating mood. Beautiful work. I am sooooo ready to put my tree up! Love it! You should tell us how you do tree toppers like those! Wow, you did a great job on her tree. I just loved the colors she chose, can't wait to see some more, so I'm staying tuned. OMG that is one beautiful tree, I am so going out to get the mesh!!! Thank you for the inspiration. You are so talented! Kristen, I can just imagine how much fun this is for the kids in the house. I remember this house from last year and wondered how you could top it, but you did! Love it! Kristen you are so talented! The tree looks so pretty! I've been thinking of using the wide mesh ribbon this yr, is it hard to use? Kristen, I am quite new to your blog and so thrilled to see your gorgeous work!!! this is stunning!! I look forward to see more of your creations!! Kristan, what a fabulous tree! You did an amazing job! Everything is just perfect! The colors are so pretty and very modern. Looking forward to more pictures. You are always so inspiring. The tree and other decorations you did are just beautiful! Love the colors and fullness of the tree. I'll look forward to seeing more pics as you do other homes. You can come and do my tree any day! ;) It is all very beautiful and festive! Your clients house is beautiful but if I may say that wooden sculpture thing is well umm....lets say unique. Mercy Me! Is that ever a beautiful tree, Kristen. Love that you shared all these gorgeous pics with us. So the lime green that we see...is that from Cracker Barrel?? It looks like netting. Tell me more! I wish we could work together. I would learn so much from you. Wow! Your client must be so pleased with your work. I stared at your tree picture for a long time trying to figure out how you did the mesh. Is it one long piece or many, many shorter pieces? That tree is absolutely beautiful! You really do have a talent for decorating. I love that polka dot ribbon! Absolutely stunning! You truly have a gift of creativity. Thanks for allowing us to peek. Can't wait to see more! Looks absolutely beautiful! Thanks for the inspiration! That would take me a week to create ~ you are so talented! Kristen it's just beautiful!!! I just love the lime green and polka dots! I'm really looking forward to more pictures. Did you put the ribbon on the tree before you put the ornaments? Very pretty! Love the lime grren color combo! Stair garland is nice too! I can't wait to start decorating for Christmas. Unfortunately, we have a policy around our house that there can be absolutely no Christmas talk until after Thanksgiving! 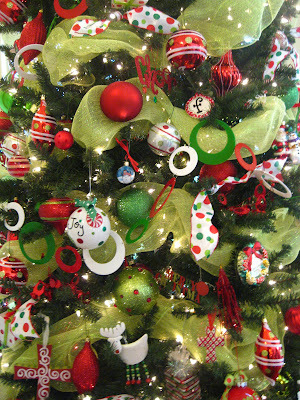 The tree is gorgeous, I love the circle garland especially. It has a fun 70's feel to it! Beautiful green mesh around the tree. I am gonna pull out my Christmas decorations tonight, thanks for the inspiration. Really want to see more. I emailed you about these because I am more than ecstatic about them! Are your polka dot bows just made of knots (kind of like your fall mesh and ribbon wreath) or are they much more complicated? I did a mini version of your tree! thank you for your email as well! Gorgeous job decorating Kristen! Can't wait to see the rest of your client's homes. I found your your blog via pinterest! I love the staircase. I am helping a friend with hers this week. Did you use the wide or narrow on the stairs. I can tell it's the wide on the tree. I know either would work, but love the look you've created! Thank you Jennifer, I'm glad you found me! I just posted this house again for this year, check out my latest post. I actually cut the mesh in half on the stairs. I don't like doing that, but if I remember correctly, we barely had enough and the place she got it was out, so I had to cut it. Thanks! What a beautiful tree and fun decor! Happy Holidays. Beautiful Ideas really love your style of decorating home like that. Really your work is awesome! Love the tree!! You have a lovely sense of style and creativity!! 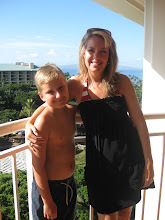 Hi I'm Julie, a publisher of Learn Your Christmas Carols Blog with more than 25,000 visitors. I've published lyrics and videos to nearly 100 different popular, traditional, funny and obscure holiday songs. This year, I will include links on Christmas recipes. Is there any content you would like to contribute with me? The only thing you would do is a link back in your sidebar or footer. If you are interested just email me at juliegallaher@gmail.com or tweet me at http://twitter.com/juliegallaher. I'm looking forward to your positive response. Thanks! Start by setting up the tree away from the wall so you have room to walk around it. Decide which side of the tree looks best to face out to your primary audience. Your decorations and tree are so beautiful. Really nice photos too. 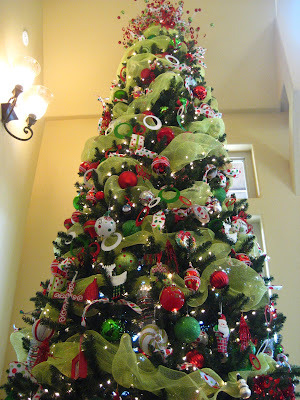 I love your way of decorating Christmas tree and home. It's look so awesome..
Nice blog! Your Christmas Decorations collection are wonderful, thanks for sharing them. 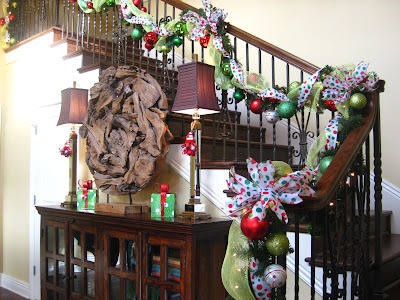 I have three words for your Christmas decorating ideas: AWESOME, BEAUTIFUL, MAGICAL! I actually have more words to say but I think those three are the most appropriate. I totally love your decor! New Frames Just Listed In My Etsy Store! My New Pillows~ and New Frames are on their way! Update on my Hubby...over all pretty good news!